Ahhh I love hearing about new pinball games and this TRON Legacy pin from Stern is looking damn hot! I was really hoping that the TRON Legacy movie would spawn at least one actual arcade game and not just the usual console nonsense! 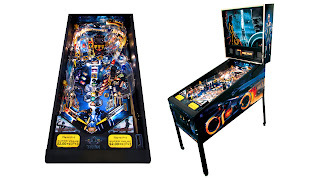 "Our TRON pinball puts the players in the middle of TRON movie and video game action battles. This is a fast moving game. TRON has 3 flippers, including an upper flipper to shot one of the two fabulous fast action ramps. We have not utilized a 3rd flipper in a while, and players will enjoy it. In the center of the playfield, near the top, there is a motorized 3 bank target assembly the player must hit and lower, to gain access to the illuminated, motorized spinning disc, representing TRON's Identity Disc. The spinning disc shoots the ball randomly across and around the playfield. Ramp shots take the player to an exciting Light Cycle multiball. The player shoots at the miniature TRON video game to start exciting features and collect big points." It's sad to see a 75 cent per game tag on it though, I hope you get more than three balls per game. We're just kinda sitting around waiting for CAX in July, but here are some movies to get excited for that are out now, or will be out in the coming months. About Hank Chien, the current Donkey Kong world record holder and plastic surgeon. A documentary about yet another historic arcade closing, this time in New York City. Pretty self explanatory, I'm really looking forward to this one!